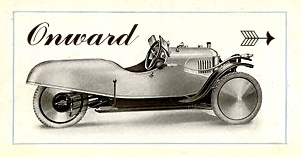 A successful maker of Wolesley sheep-shearing machines based near Birmingham, Herbert Austin launched into cars about the same time as Morris. They both grew rapidly side by side. When Austin brought out the revolutionary vest-pocket sized Austin Seven, Morris was not far behind with the Morris Minor. Herbert received a knighthood, and ended up as Baron Longbridge, the Austin’s location near Birmingham. A so-called joke was bandied around during my boyhood: "I hear there aren’t going to be any more Baby Austins. Lady Austin has discovered a new Dodge." Har, Har. Saloon is English for sedan. This was a very small car with a sort of upright body. Interestingly, it was yellow. That makes three of my cars that have been that color. Any significance? The two large doors opened at the front, and, during the tenancy of many former owners (for I could afford only the cheapest of cars) the up-and-down vibration of the doors had ground away the latches. Bolts had been added. If one forgot to fasten a bolt the wind pressure would eventually spring the door open with a startling bang (and a big lurch of the car). The rear quarter of the body had little holes punched in it where the door handles had been swung back with force. The two roof pillars on either side of the upright windshield had also fractured at the cowl line, so the roof and the rest of the body would pound up and down as one went over bumps. There was no luggage compartment (or, boot, in English) but there was a built-in fold-down luggage rack at the rear. When any weight was put on this it tilted back the body, lifting up the windshield pillars quite considerably. I sought a partial cure by having the pillars welded, but the forces proved too much for the welds; so plates were screwed on. This worked, provided one tightened the screws regularly. None of these cars had heaters, and one wintry day, returning home from London over the Cotswolds with my late cousin Benita, the only way to effect any visibility was to keep one's hand pressed against the inside of the windshield to provide a little thawing for the wiper to work. Very primitive. The doors, being very warped, (particularly at their lower, leading corners, which had suffered from many an encounter with the kerb) scooped in streams of frigid air through their leading edges. I remember reading about an improvisation by a team taking part in one of the rallies then popular -- from Murmansk to Monte Carlo or some such. Crossing the Alps they encountered icing and, using their trusty metal shears, they cut vents in the hood to allow some of the engine heat to flow onto the windshield. This is how great inventions are born. 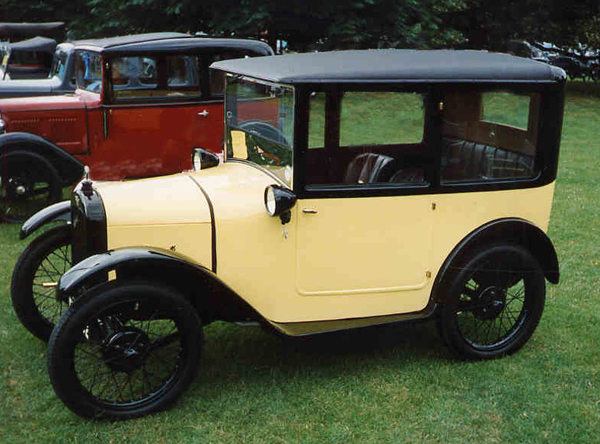 More information and photos on this car may be viewed at "Andy's Austin 7 Page"